"I need you, Vince. Honest to God I do. We're going to show these bananas how to operate." If you can overlook the tough-to-swallow casting of Kirk Douglas and Alex Cord as brothers, and Italian brothers at that, then you actually might find yourself enjoying this 1968 mob thriller from director Martin Ritt (Sounder, The Great White Hope). Released just a few short years before The Godfather would seemingly reinvent the entire mafia crime genre, The Brotherhood does a pretty good job telling the story of an aging mobster caught between two very different and conflicting styles of organized crime. Frank Ginetta (Douglas) is an old-school mob guy who would much rather things ran like they used to, in what he remembers as the good old days, before his Mafioso father was gunned down. The modern-day methods of the new world of organized crime are foreign to him, and Frank finds himself suddenly butting heads with The Board, a powerful group of mafia businessmen looking for ways to "appear legitimate." When his younger brother Vince (Cord) gets drawn into the "family" early in the film, Frank believes he has found an ally in his struggle to retain the old ways, "just like Pop." The only problem is that Vince has more of a grasp on the new ways than brother Frank does, which only serves to drive a wedge between them. Douglas, the seasoned movie legend, chews things up nicely as a man stuck hopelessly in the past, but Cord is awkwardly bland as his open-minded brother. Most of their scenes together are excuses for Douglas (who also received producer credit) to deliver some chatty hunks of dialogue in that trademark stern-jawed way that he has, and unfortunately the guy is such a film icon that much of the time I could only see Kirk Douglas, not Frank Ginetta. The Sicilian mafia leaders, led by a wonderfully cadaverous Eduardo Ciannelli, are right out of Central Casting, and they lend an almost comic-book quality to the proceedings. Even with the casting quirks, the Lewis John Carlino (The Mechanic, Honor Thy Father, The Great Santini) screenplay still holds up fairly well. In fact, Carlino touches on themes that films like The Godfather would more eloquently elaborate on as the era of the mob movie evolved in the 1970s. Unlike mob films of today, however, there is relatively little on-screen violence in The Brotherhood. While there isn't really any bloodshed, there is a pretty tense scene late in the film when Frank carries out a very personal hit, and it is a long, slow and torturous process. On an unrelated note, what's with the cover art? Look at that giant closeup of Douglas; that thing would scare small children away. Image Transfer Review: Paramount gets good marks on the source print quality on this 1.78:1 anamorphic widescreen transfer; considering it is from 1968, there is relatively little in the way of blemishes, other than a few white specks. Colors, especially during interior shots, look fairly bright throughout. The downside is the excessive ringing and haloing that is present during just about every major scene, and it is frankly quite a distraction. I could be more more lenient on a weaker color palette if the compression issues were not as significant. Audio Transfer Review: Two mono tracks (English and French) are provided, and neither have real detriments, other than the typical fidelity limitations. Dialogue is clear and hiss-free, though the noisy Lalo Schifrin wah-wah score sounds a little harsh at times. Extras Review: Nothing here but 16 chapters and English subtitles. 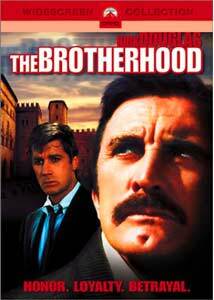 It's all about family honor, both of blood and the mob, in this late 1960s crime drama. If Paramount hadn't spilled a major plot point on the back cover, I might have enjoyed this one even more, so take that as a warning. The Brotherhood tells a decent story about the old ways versus the new, and how sometimes change is a hard thing to accept. The image transfer isn't the best, but it's recommended as a rental for mob movie fans.